Our top renovated, approximately 75 m² holiday home can accommodate up to 6 people (3 bedrooms). The newly created terrace with natural swing leads to the harmoniously designed living / dining area, which is characterized by a cozy wood-burning stove. The living room has cable (HD) -TV / flat screen with BlueRay player their place. The comfortable dining area offers plenty of seating and invites to game evenings. In the 1. Upstairs is the fully equipped kitchen with: ceramic hob, dishwasher, fridge + freezer, oven, microwave, coffee maker, capsule machine from ALDI, kettle, toaster etc. To the left is the bathroom with shower and toilet. Then it is the 1. Bedroom with double bed and toilet en suite. A staircase leads to the two other bedrooms. On the left is another double bed with additional TV / DVD its place, while to the right two single beds with washing machine the 3rd. Round off the bedroom. Both upper bedrooms are connected by access to the balcony. A modern electric heating, all rooms are heated sufficiently. Bed linen and a set of towels can be booked for 10 € (per person). Even for the little ones provide a cot, bed rails, high chair, bath and toys for a pleasant atmosphere. In the entire house is also a W-LAN guest access included. We are also very happy about every four-legged friend in our "Hüttenzauber". Dog tags for 2 dogs available! The house has two parking spaces, which are expelled. The final cleaning of 70 € and the linen package please pay locally! In the winter months (until 30. 04. 19) energy costs are added, which are also settled on the spot. The bathroom is small but nice and sufficient. In addition to sleeping in the premises. 1 Stock there is an additional toilet with wash basin en suite. Especially very practical :) with several people. If necessary, you will also find a baby bath on site! In diesem Haus hat man alles, um eine schöne Zeit zu verbringen. Alles ist sauber und für ein Ferienhaus reichlich eingerichtet. Es ist ein sehr schönes Haus in ruhiger Lage zum entspannen. Man die Möglichkeit einfach nur zu entspannen aber auch schnell nach Willingen oder Winterberg zu kommen. Auch der Edersee war ein sehr schöner Ausflugsort. etwas schwierig war die komplizierte anleitung und nutzung des fernsehers. aber einige tage ohne fernsehen sind auch erholsam. Sehr gute Ausstattung und sehr gemütlich. Die Ausstattung des Hauses ist perfekt. Mit dem Ofen ist es sehr gemütlich. Es hat genügend Platz für 6 Personen mit Hund. Alles da für ein gemütliches Wochenende! Es war ein super schöner Kurzurlaub. 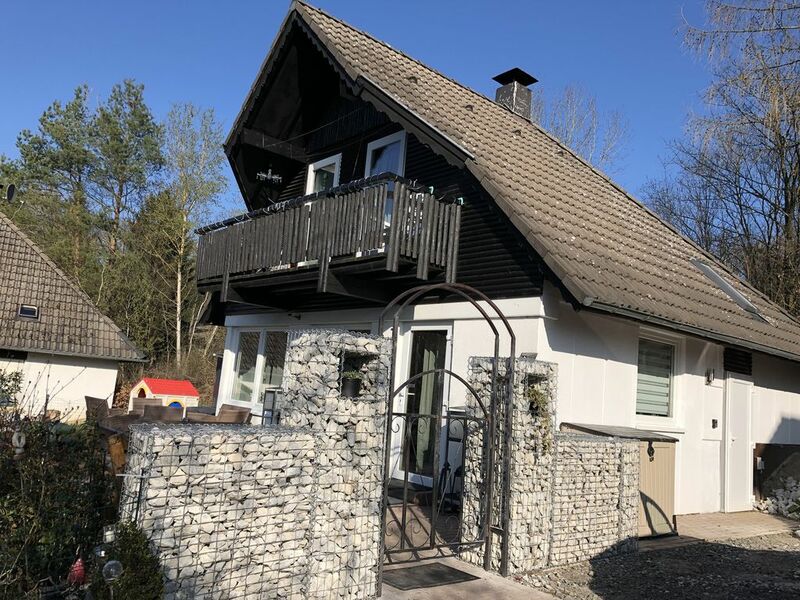 Das Ferienhaus ist super liebevoll eingerichtet und mit so vielen kleinen Details versehen, dass es einfach nur Spass macht auf Entdeckungstour zu gehen. Absolut unschlagbar war der eingezäunte Garten. Hierdurch konnte unser Hund die Vorzüge eines Gartens so richtig genießen. Die Abwicklung war auch absolut problemlos und einwandfrei. Jederzeit wieder gerne! Wer Ruhe und Entspannung sucht ist hier goldrichtig! Alles was man braucht auf kleinstem Raum zusammen. Der Nationalpark ist direkt vor der Tür. Wir haben die Zeit sehr genossen. Vielen Dank! Immediately adjacent to the north Hessian town Frankenau, on a forested slope of the National Park Kellerwald-Edersee, is the one developed in the seventies, holiday park Frankenau. These 200 houses are located, including our small, cozy cottage counts. The town Frankenau, which directly adjoins the National Park Kellerwald-Edersee in the Sauerland region, has a small-scale local supply around the core of the church. Bank, ATMs, doctors and restaurants are in the nucleus exists. A modest public transport also exists and combines Frankenau with Bad Wildungen and Frankenberg. Es fällt eine Endreinigung in Höhe von 70 € an, die jedoch vor Ort bezahlt werden muss. Auch evtl. Wäschepaket kann für 10 € pro Person vor Ort bezahlt werden. In den Wintermonaten (01.10. - 30.04.) fallen Energiekosten i.H. von 0,30 € pro kW/h an, die ebenfalls vor Ort abgelesen und bezahlt werden muss.